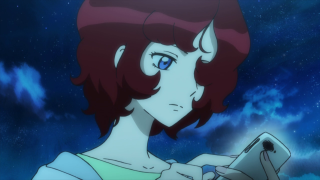 Episode 23, "Just Then, An Old Buddy Said Something"
Episode 22, "Answer Me, Zantetsuken"
Synopsis: Fujiko is a prisoner of Enzo, the head of the Shake Hands group responsible for PeopleLog and Lupin's current professional woes. 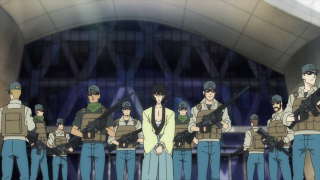 Our sideburned swindler storms the headquarters with Jigen, Goemon, and Ami, to save Fujiko and take apart the pernicious program. 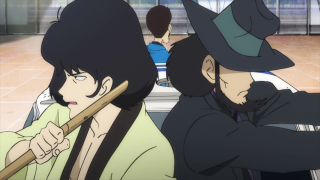 However, incensed about being referred to as merely "Lupin's underling", and egged on by Enzo, Goemon makes a startling decision that halts the entire operation. 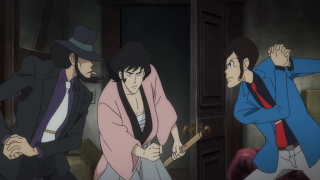 How will Lupin answer Goemon's wavering blade? 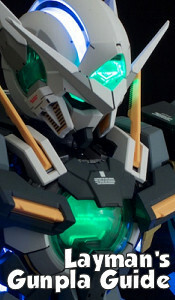 No matter how you slice it, the ending of this entry is unforgettable! 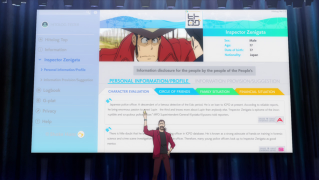 Episode 21, "An Outdated Master Thief"
Synopsis: Enzo, the president of Shake Hands, unveils his new app, PeopleLog, which compiles information about any person within moments, and supposedly blocks inaccurate information. 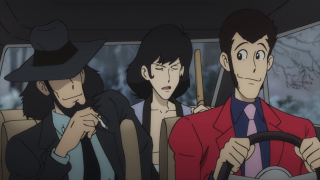 While attempting to steal a statue, Lupin, Jigen, and Goemon are repelled by a public incident involving the app. 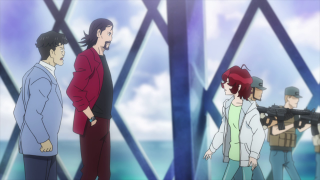 While discussing the new phenomenon, the three are identified by a restaurant patron, and have difficulty escaping from the law and crowds. 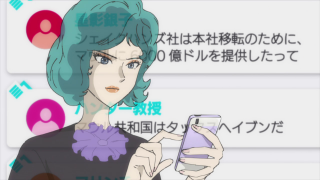 Beset on all sides by the police and old enemies looking to settle grudges, they decide to contact Ami for her expertise. 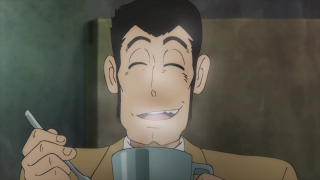 Inspector Zenigata passes along to Lupin that Fujiko has been captured by Enzo, who sees the Lupin crew as outdated. 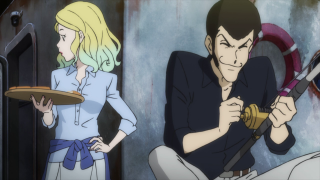 Episode 20, "Zenigata, Gentleman Thief"
Synopsis: Lupin, Jigen, and Goemon return to small town in Russia where they'd previously pulled a heist, with the intention of grabbing more loot. 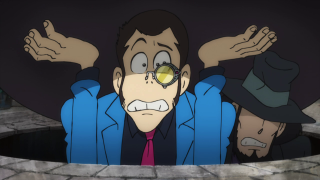 However, every attempt they make is interrupted by three other thieves, and one is Inspector Zenigata! 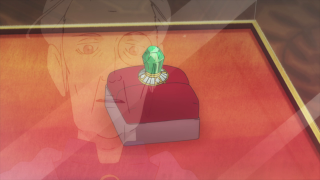 Apparently Pops, suffering amnesia, is going under the name Monety, and pulling capers to get closer to his lost memories. 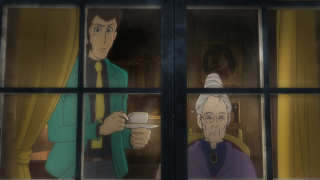 Is Lupin more concerned with returning his enemy to his normal state or rather outraged by the new competition? 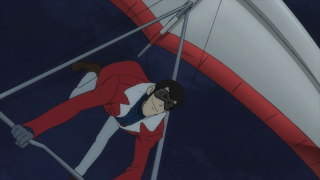 It's a trip down memory lane in this competition to be the superior stealer! 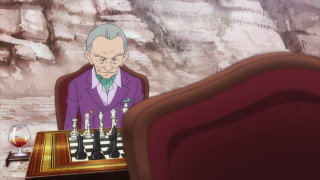 Episode 19, "A 7.62 mm Mirage"
Synopsis: A wealthy man named Zylberstein challenges Lupin to a chess match by having people around him shot by a sniper. 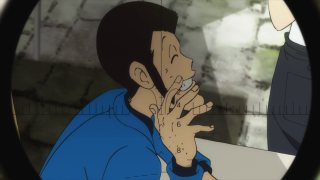 Lupin reluctantly accepts the bet of a million euros for the winner of the game, but is meanwhile targeted by the old man's sniper, Mirage. 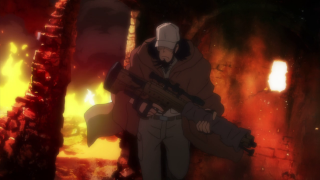 Jigen, an old acquaintance of Mirage acts as a counter-sniper, and the ordeal becomes two simultaneous battles of skill. 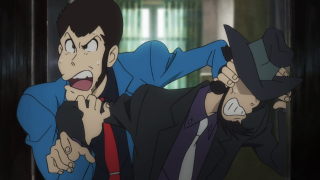 Can Jigen bring himself to kill this former comrade? 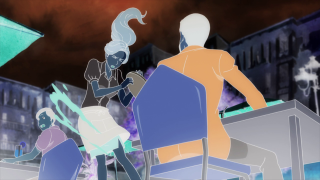 It's checkmate in this intense double attack!